David Segura is a Costa Rican who grew up abroad. That’s why he’s as confused about Costa Rica winter and summer as anyone. Here he tries to make sense of why Costa Ricans call summer winter and winter summer. Most would think defining the seasons of the year is a straightforward process. There is a lot of science supporting the basis for seasons and indicators of the seasons manifest themselves each year with little thought ever given to their definition. But what I thought would be straightforward is just the opposite in Costa Rica. Costa Rica uses the word “verano” (summer) to describe winter and “invierno” (winter) to describe summer. It is also common to hear summer to describe the dry season and winter to describe the wet season. At first this seems irrational because in the northern hemisphere, December, January, and February are the winter months and June, July, and August the summer months. Living in the northern hemisphere, winter was obvious and verified with a thermometer registering lower temperatures, shorter days, trees dropping their leaves, animals hunkering down and dreary clouds staying overhead. At least this was my reality growing up. This all changed when I heard Costa Ricans calling the winter months summer and summer months winter. At first I thought this was a translation issue from Spanish to English but after learning the Spanish words had the same meaning, the search to find the reason for ignoring science began. The facts, the science, my professors and teachers, my parents, and all the books I’ve read all say this just isn’t right. It would be like calling the world flat in the face of science and known facts. But amazingly, Costa Ricans are right. I was in denial for a long time and I kept saying, “It ain’t so, Joe”. But it is so, and I hope I can explain why I’ve come to this bizarre conclusion contradicting everything I learned. Costa Ricans refer to the traditional winter months as “summer”. Everyone in Costa Rica calls this time of the year, January, “verano” or summer. There isn’t a scientist, astrophysicist, dictionary, or teacher I can find who can define the Spanish word verano as different from its literal meaning except in Costa Rica. This is one of the few places on earth where an entire population has interchanged the Spanish words invierno and verano. Yes, when asking someone from Costa Rica what the definition of invierno is, the response will be, winter, as it should be. The problem arises if you’re in the northern hemisphere and when it applies to the months of June, July, and August. In Costa Rica, verano, meaning summer, applies during the traditional northern hemisphere winter months. It refers to the Costa Rican dry season. There doesn’t seem to be anything documented in local textbooks or dictionaries providing a clarification. But the informal interchange of the meaning of summer and winter persists throughout society. The result of an unscientific survey conducted over the last ten years helped support my understanding of how Ticos use verano and invierno. Everywhere in the world the word invierno means winter and verano means summer except in Costa Rica and a few other tropical countries like Venezuela. Ask any Tico right now and they will say we are in the summer and use the word verano. Just this week I asked three more Ticos one last time. Two of these people were from the town of Grecia about 45 minutes east of San Jose and the other from central San Jose. The question was, what season of the year are we in right now (January)? The three questioned are relatively young and well educated. One is a dentist, another a successful businessperson living in the USA returning for a family visit, and the third another successful businessperson. Each responded by saying the season we are in right now is verano – summer. To be fair, each clarified their reply by also adding that it’s the dry season. But all three stuck to their guns when choosing the word verano to describe the season. Even after clarifying the literal definition and confirming our position in the northern hemisphere and with everyone agreeing with that definition, I posed the question again, and the response was the same: It’s summer during the month of January. It’s difficult for anyone outside Costa Rica to ignore science and what is ingrained in our minds since we learned about the seasons from an early age. Costa Ricans have grown up for generations understanding that the winter months including January are summer and the northern hemisphere summer months are winter. This article attempts to provide a basis for the traditional worldly understanding of these two seasons of the year. I’ll start with the universal definition of the words summer and winter, confirming location and an explanation of the summer and winter solstice, then continue with a little myth busting and cultural understanding. I’ll follow up with why Costa Rica is correct to change the definition and reverse the meaning of these two words. The reader will hopefully gain a better understanding of cultural norms and how they impact our core beliefs. Location of Costa Rica: Northern or Southern Hemisphere? Peñas Blancas is the most northern point of Costa Rica, on the Nicaraguan border with a latitude of: 11°12’40.15”N. Punta Burica on the Panamanian border is the most southern point with a latitude of: 8°1’48″N. With a latitude range between 8 and 11 degrees north, there’s no doubt Costa Rica is in the northern hemisphere, lying between the Equator and the Tropic of Cancer. Definition of summer and winter. The next step is to determine the actual definition of winter and summer, keeping in mind you can replace the English words for the Spanish ones as the definition is the same in both languages. “the season between autumn and spring, lasting from November to March north of the equator and from May to September south of the equator, when the weather is coldest”. “the season between autumn and spring comprising in the northern hemisphere usually the months of December, January, and February or as reckoned astronomically extending from the December solstice to the March equinox”. “Winter is the coldest season of the year in polar and temperate zones (winter does not occur in most of the tropical zone). It occurs after autumn and before spring in each year. Winter is caused by the axis of the Earth in that hemisphere being oriented away from the Sun. Different cultures define different dates as the start of winter, and some use a definition based on weather. When it is winter in the Northern Hemisphere, it is summer in the Southern Hemisphere, and vice versa”. And so on. It seems all dictionaries or encyclopedias define winter and summer as the same. Only Wikipedia recognizes that culture can define the start date, or define the season based on weather. But no source suggests cultures go to the extreme point of reversing the definition of the words summer and winter. The science behind summer and winter. Scientifically, the amount of energy in hours and concentration defined by watts per area of light (energy) striking the surface of the Earth defines winter and summer. The tilt of Earth’s axis and its location in the orbit around the Sun determines this. The Earth is tilted 23 degrees 27 minutes off perpendicular to its orbit. As it spins, the North-South axis points gradually moves away from (winter) and toward (summer) the Sun. 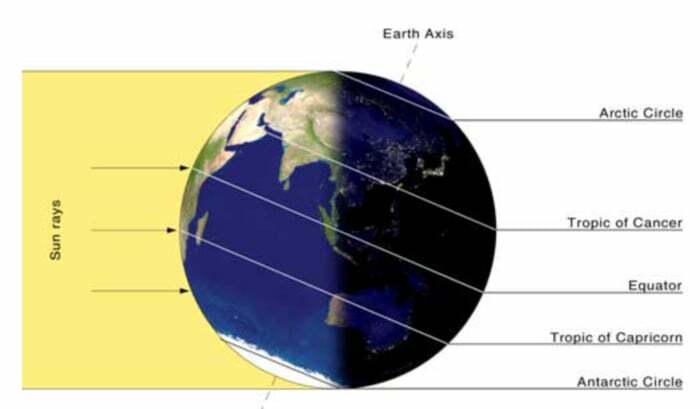 This determines how many hours of daylight and darkness we receive during each of the seasons. In the Northern Hemisphere, as we approach the Winter Solstice (December 21), the daylight hours are short and the weather is cold. “The winter solstice occurs at the instant when the Sun’s position in the sky is at its greatest angular distance on the other side of the equatorial plane from the observer’s hemisphere. The seasonal significance of the winter solstice is in the reversal of the gradually lengthening nights and shortening days”. So the amount of light during the day determines the season. Forget about cold temperatures, dreary skies, wet or dry weather, whatever you use to define winter. It’s all about the amount of daylight. If, in fact, the amount of daylight in Costa Rica is shorter in December than any other time of the year, then Costa Rica should be in its winter season right now. 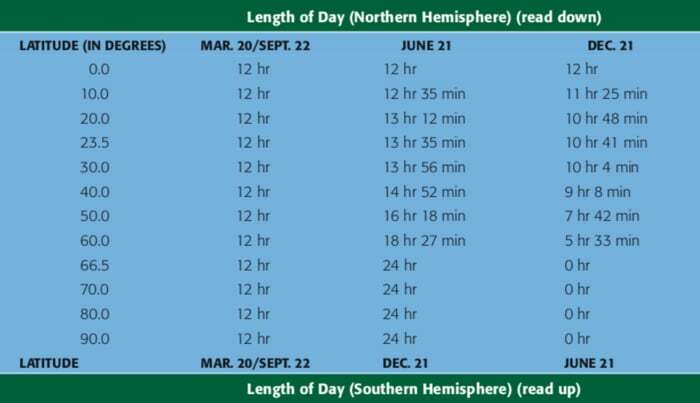 Considering San Jose, the capital of Costa Rica, is 9 degrees north of the equator, it should be simple to review any meteorological table to determine the variation of daylight throughout the year. If San Jose receives less daylight in January than in July, it would be safe to say Costa Rica is now in its winter season as defined by science. The table below shows the months between October and March as having the shortest amount of daylight in the Northern Hemisphere and so satisfies the definition of winter. This table shows the varying length of day with latitude. The period between the rising and setting of the sun is the day length. It does not include the period of twilight before and after sunrise and sunset. Read the months on the left of the table for the northern hemisphere. More specific to Costa Rica, timebie.com provides the number of daylight hours for any day of the year. Using this as the basis, the number of daylight hours on 21 December 2018 was 11 hours, 33 minutes, while the number of daylight hours on 21 June 2018 was 12 hours, 41 minutes. A difference of 1 hour and 8 minutes between the winter and summer solstice in terms of daylight hours. The difference is not much and may be considered negligible, but it shows that December in Costa Rica is winter. Then how is it possible they interchange the words for summer and winter in Costa Rica? There are several thoughts on how this started. One line of thought is it feels cooler during the rainy season between May and November and so it must be winter. Others believe the dry season marks the beginning of summer around the second week of December because it is hotter, or at least it feels that way. To validate these beliefs, the Costa Rican Instituto Meteorologico wanted to determine if the temperatures during rainy season are cooler. 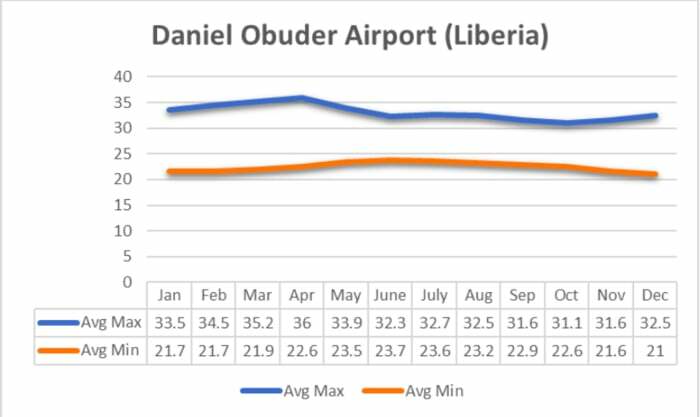 The IMN produced four different reports for each of the main airports in the country including Tobias Bolaños Airport in San Jose, Juan Santamaria International Airport in Alajuela, Daniel Oduber Airport in Liberia, and the Limon Airport on the Caribbean coast. Using data from three of the four reports it is easy to review the average maximum and minimum temperatures by month for various parts of the country. Data for Tobias Bolaños includes weather data for every 15 minutes over a 10-year period. If the temperatures show cooler weather during the June/July (rainy season) then maybe the basis for how Costa Rica perceives the temperature and relates it to winter or summer could be a possible explanation. The Tobias Bolaños Airport in the central valley of Costa Rica provides a good reference for nearly half of the country’s population. The data for average minimum temperature, although close, shows definite cooler temperatures during the traditional winter months of December to April, while June, July, and August are in fact, on average, warmer. 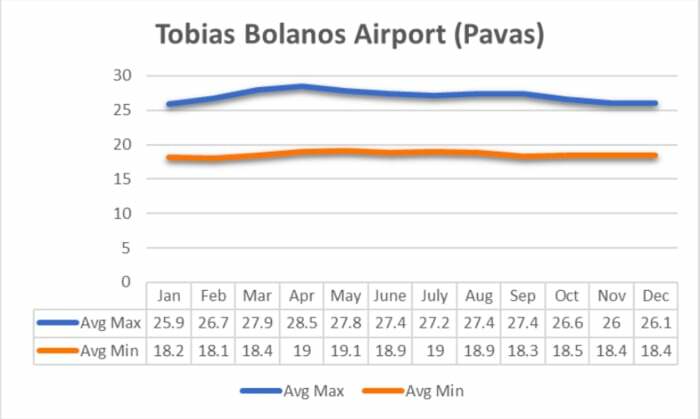 Altitude is a key factor in this assessment as Tobias Bolaños airport sits at an elevation of 1,002 meters (3,287 feet). As a reference, temperatures will decrease an average 3.5 degrees Fahrenheit for every 1,000 feet of elevation gain or about 1.2 degrees Celsius per every 100 meters. Another condition applies at the Daniel Oduber Airport on the Pacific coast of Costa Rica in the city of Liberia, Guanacaste. The data below shows that not only is it much hotter at an elevation of 269 feet (82 meters), but that there is no real noticeable difference between December’s average maximum of 32.5 C and July’s of 32.7 C.
Interestingly, there is a 4.9 C difference between the very rainy month of October with an average maximum temperature of 31.1 C (87.9 F) and an average of 299 millimeters of rain during the month and 36 C (96.8 F) during the parched month of April when there is only an average of 67 millimeters of rain. This could support the Costa Rican belief that the “rainy” season is cooler, and therefore as good a reason as any to refer to this time of year as winter even though the days are shorter in October. 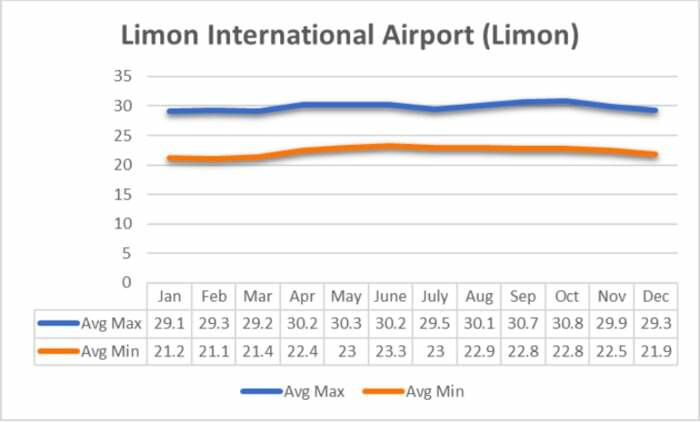 Comparing both the Central Valley and Pacific locations with the Caribbean city of Limon at an elevation of 2 meters, the data shows the maximum average temperatures 2-5 C less than in Liberia. But the more important issue is the difference in temperature between December and July. For practical purposes, this is the same at 29.3 C versus 29.5 C respectively. Even when comparing the hottest average maximum temperature month of October at 30.8 C, the difference is negligible. The data doesn’t support the temperature or “it’s cooler” in the Costa Rican winter time of the traditional northern hemisphere summer months of June-August theory. It doesn’t suffice in justifying why Ticos call the traditional summer months winter in Costa Rica. 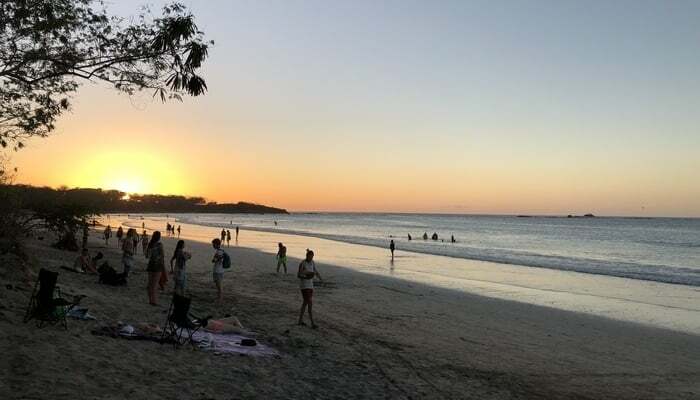 There may be a belief it is warmer in the Costa Rican winter (meaning summer) because of the misconception the sun is farther away from the earth during this period. It’s true the Earth’s distance from the Sun changes during a year. In fact, the closest approach of the earth to the Sun happens in winter, around December 21. It’s hotter close up, and cooler at a distance. But this common-sense notion is not the cause of the seasons. As already stated, the definition of winter and summer is because of the amount of light during the day. So, although it may be possible to consider the proximity of the sun with colder or warmer temperatures and provide a possible justification for why Costa Ricans have interchanged the words summer and winter, the facts don’t justify the change. So, if it’s not the distance to the sun, and it’s not the perception that rain is causing colder temperatures, then why have Costa Ricans interchanged the definition of winter and summer? Let’s look at the etymology and definition of the words winter and summer in both English and Spanish to understand why Costa Rica has applied a different meaning. 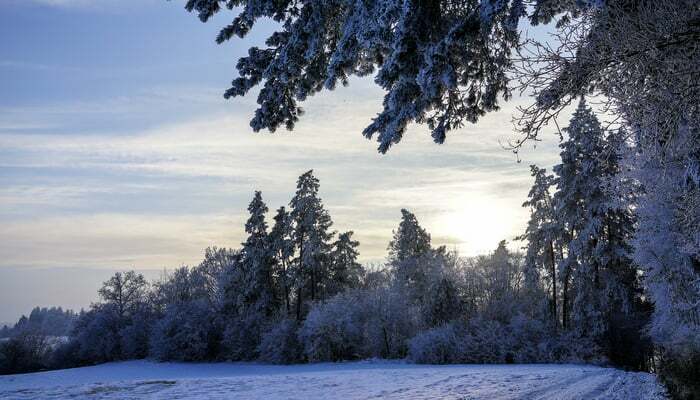 “Winter”, derives from the Proto-Germanic wentruz. This, in turn, probably comes from the Proto-Indo-European (PIE) wed, meaning “wet,” or it may come from the PIE wind-, meaning “white.” Either way, the Proto-Germanic wentruz gave rise to the Old English “winter” as the fourth season of the year, and the name for the season has stuck around ever since. “Summer”, before 900; Middle English sumer, Old English sumor; cognate with Dutch zomer, German Sommer, Old Norse sumar summer; akin to Sanskrit samā half-year, year, Old Irish sam-, Welsh haf summer. “Verano”, derives from Vulgar Latin (tempus) veranum, from Latin vēr (“spring”), from earlier *veror, from Proto-Italic *wezor, from Proto-Indo-European *wésr̥ (“spring”). Compare Portuguese verão. Verano comes from veranum, which in Latin could refer to either spring or summer. (Source: Erichsen, Gerald. “The Four Seasons in Spanish.” ThoughtCo, Sep. 20, 2018, thoughtco.com/the-four-seasons-3079618). “Verano”, sharing a common root with Sanskrit Hima-laya (“abode of snow”). In the major Romance languages, “spring” was replaced by expressions relating to first or prime spring (Spanish, Portuguese, and Italian primavera) or season (French printemps). Spanish primavera initially conserved the meaning of “beginning” of spring, with Verano referring to the end of spring – beginning of summer. When Primavera became the general term for “spring”, Verano moved to “summer”. The original Latin for “summer” survives in estio and estival, although Verano and de Verano are far more common. Where do we stand after all of this academic and scientific mumbo jumbo? Well, right where we started, at least in Costa Rica. It may be possible to use several arguments to support the Costa Rican basis for using the word winter for what is summer and summer for what is winter. One of these arguments could be that the Sun is further away from the earth during the months of June, July, etc. Maybe the tiny difference in temperature between the two seasons supports the Costa Rican definition. This would only apply to the northwestern part of the country as the data is inconclusive or showing insufficient differences. It could be because of the origin of the words – that the word invierno (winter) comes from the word to hibernate and during the Costa Rican dry season it’s hot and people need to “hibernate” from the heat. Or maybe it’s because the word winter may come from the PIE word WED which means “wet” and therefore because of the Tico belief that the wet season is winter. That’s stretching it, I know. But the rational basis for using either of the words, summer or winter in their proper context should apply. The science is clear and the definitions supporting the data is clear. But regardless of the facts, Costa Rica continues to reverse the meaning of these words because of its culture. The culture says it is wintertime when it is scientifically summer and vice versa. A nation, a people, must respect its culture to maintain its connection to its past regardless of science. But there’s a point when a culture should recognize science as a foundation of the education system in the country. But until people can make this transition, the culture of the people must remain. Unfortunately, schools don’t teach the science of summer and winter, and the cultural definition seems to have prevailed. It’s as if the world is flat. Eventually, Costa Rica should either eliminate the terms summer and winter from their vocabulary, use the words correctly as science defines them, or replace them with the words “dry” and “wet” season. When using these words one must consider science. Changing their literal definitions adds nothing to our culture. However, bracketing them in the context of culture, then maybe there is a possibility they can cross the divide between ignoring science and the norms of a country. Ultimately, there doesn’t seem to be any scientifically consistent basis for why Costa Rica has interchanged the words summer and winter and in the face of facts continues to use these words differently than the rest of the world. A review of the science, supporting meteorological data for the country, and general understanding of “culture” points to one reason. Culture. Look to “cultural norms” as the explanation, not the science. In the process don’t completely forget the science, though, and hopefully the world will be a better place through a better cultural understanding. 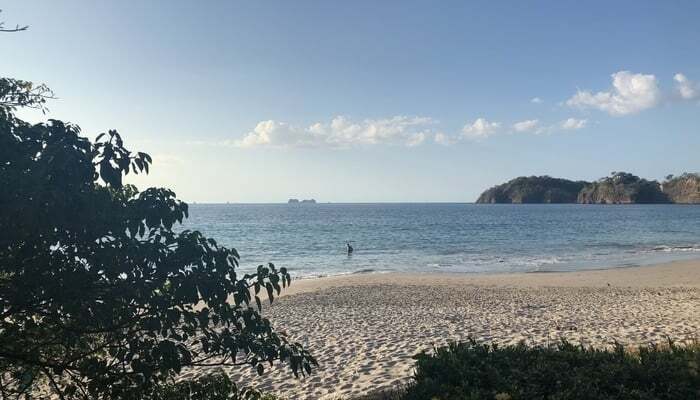 Costa Rica will eventually transition to applying the correct meaning to the words summer and winter, or change completely to only using the dry or wet season. Let’s not rush it.